SOUTH CAROLINA PORTS EXPECT TO SEE BENEFITS IN THE NEXT FEW MONTHS FROM THE UPSIZING OF VESSELS IN RESPONSE TO THE PANAMA CANAL EXPANSION: “Container lines will soon need to deploy 8,000 TEU ships and above to ports with the right mix of attributes to handle those vessels,” said SCPA CEO Jim Newsome. Slightly lower container volumes in April is consistent with trends seen in major east coast ports. SCPA CEO Jim Newsome expects May to be the strongest month this year for South Carolina ports. The South Carolina Ports Authority reported a 2.8 percent increase in twenty foot-equivalent unit (TEU) volume fiscal year to date, handling 1.6 million TEUs since July 2015. SCPA moved 157,959 TEUs in April, bringing SCPA’s calendar year-to-date container volume to 631,753 TEUs. As measured in pier containers, or total box volume, SCPA handled 89,326 containers last month. Since the fiscal year began in July, SCPA has moved 907,259 containers across the docks of its Wando Welch and North Charleston container terminals. Non-containerized cargo volume at the Port of Charleston was strong in April, with 74,915 pier tons handled. Charleston’s breakbulk volume is 32 percent ahead of plans for the fiscal year, with 746,460 tons moved from July through April. Inland Port Greer handled 8,182 rail moves in last month. The facility has handled 75,214 lifts since July, bringing fiscal year-to-date moves 54 percent higher than the same period last year. In separate news, the SCPA’s board approved two contracts for projects at container terminals, including annual maintenance dredging at the North Charleston Terminal and a terminal planning study for the Wando Welch Terminal. 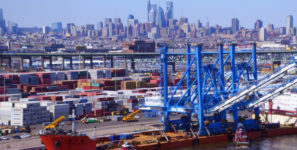 SCPA is finalizing a solution to the Safety of Life at Sea (SOLAS) regulations whereby it will provide the long-utilized terminal scale weights from certified scales as verified gross mass (VGM) directly to shipping lines as contemplated by Coast Guard rules. The port will withdraw its proposed $25 fee for direct provision of weights to shippers, as this charge will no longer be necessary.